Chiari III malformation is the rarest of the three classes of hindbrain anomalies described by Chiari in 1891. There is herniation of the posterior fossa contents into an associated occipital or high cervical cephalocele with the other features of a Chiari II malformation. Patients have severe neurological defects and a poor prognosis. 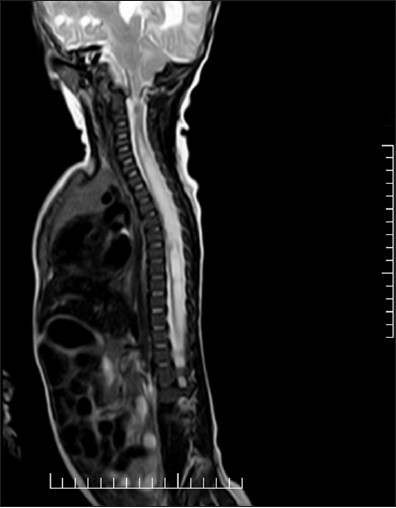 Abnormalities noted on MR imaging include encephaloceles containing varying amounts of brain tissue, ventricles, cisterns with petrous and clivus scalloping, cerebellar hemisphere overgrowth, cerebellar tonsillar herniation, deformed midbrain, hydrocephalus, corpus callosal dysgenesis, posterior cervical vertebral agenesis and spinal cord syrinx. The size of the sac, its contents, presence of hydrocephalus, infections and other associated abnormalities are associated with a bad prognosis. 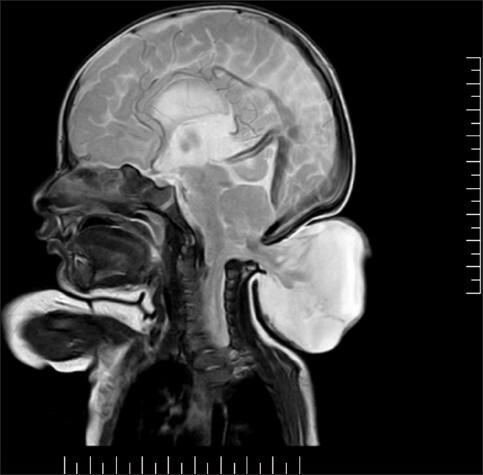 We report a rare case of asymptomatic Chairi III malformation in a neonate with associated short posterior fossa, high arched tentorium, tectal beaking and holocord syrinx which was treated surgically at our institute. This was a case report of a 1-month-old male child weighing 3 kg who was a full-term normal delivery, born of nonconsanguineous parents. He had large occipital and upper cervical encephalocele which was 6 cm × 4 cm in size, fluctuant, non-tender, non-pulsatile and only partially transilluminant. The skin over the swelling was normal with dilated veins. He was taking feeds adequately, had a good respiratory effort and was moving limbs spontaneously and symmetrically. The antenatal history was uneventful. Magnetic resonance imaging revealed an occipital encephalocele with herniation of a major portion of the cerebellar contents into it. There was associated tectal beaking and holocord syrinx [Figure 1], [Figure 2], [Figure 3]. Patient was operated for the encephalocoele and contents reduced, dysplastic elements excised. C1-2 laminectomy was done along with dural repair to accommodate the tonsillar herniation. The child withstood the procedure well and was discharged on day 8 after suture removal. Chiari III malformation is the rarest of the Chiari malformations. Its embryogenesis is based on unifying theory which holds true for both Chiari II and III formation. , According to this theory, an open neural placode allows cerebrospinal fluid to escape from the central canal of the caudal neural tube. The interference with adequate enlargement of the telencephalic and rhombencephalic ventricles causes less support for the telencephalic hemisphere (resulting in disorganized migration of neurons from the ventricular zone, producing cortical heterotopias, gyral anomalies and callosal dysgenesis) and the rhombencephalon (influencing cerebellar and brainstem development), respectively. Our patient had in addition to the suboccipital encephalocoele, a small posterior fossa, high tented tentorium cerebelli, tectal beaking along with a holocord syrinx. Chiari III malformation usually has a dismal prognosis with most reports stating an early death and severe disability. Raimondi, however, has stated that occasionally, elements in the encephalocele sac are necrotic, gliotic, or may represent heteropia or meningeal fibrosis and therefore, are amenable to excision without increasing neurological deficits. Similarly in our case, the dysplastic cerebellar tissue was excised and C1-2 laminectomy performed to accommodate herniated cerebellar tonsils. The child had tolerated the procedure well and is on regular follow-up. 1. 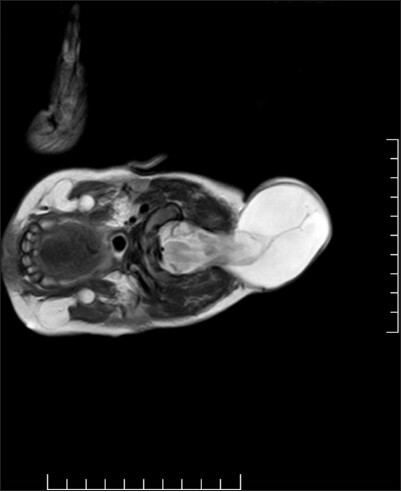 Garg K, Malik N, Jaiswal AK, Behari S. Chiari III malformation with hypertelorism and microcephaly in a neonate: Case report and a review of the literature. J Pediatr Neurosci 2008;3:169-71. 2. Cama A, Tortori-Donati P, Piatelli GL, Fondelli MP, Andreussi L. Chiari complex in children - Neuroradiological diagnosis, neurosurgical treatment and proposal of a new classification (312 cases). Eur J Pediatr Surg 1995;5 Suppl 1:35-8. 3. Häberle J, Hülskamp G, Harms E, Krasemann T. Cervical encephalocele in a newborn - Chiari III malformation. Case report and review of the literature. Childs Nerv Syst 2001;17:373-5. 4. Castillo M, Quencer RM, Dominguez R. Chiari III malformation: Imaging features. AJNR Am J Neuroradiol 1992;13:107-13. 5. Kiymaz N, Yilmaz N, Demir I, Keskin S. Prognostic factors in patients with occipital encephalocele. Pediatr Neurosurg 2010;46:6-11. 6. Hadley DM. The Chiari malformations. J Neurol Neurosurg Psychiatry 2002;72 Suppl 2:ii38-40. 7. McLone DG, Dias MS. Normal and abnormal early development of the nervous system. In: Cheek NR, Manlin AE, McLone DG, Reigel DH, Walker ML, editors. Pediatric Neurosurgery. Surgery of the Developing Nervous System. 3 rd ed. Philadelphia: WB Saunders and Company; 1994. p. 3-37. 8. McLone DG, Knepper PA. The cause of Chiari II malformation: A unified theory. Pediatr Neurosci 1989;15:1-12. 9. Lee R, Tai KS, Cheng PW, Lui WM, Chan FL. Chiari III malformation: Antenatal MRI diagnosis. Clin Radiol 2002;57:759-61. 10. Raimondi AJ. Pediatric neuroradiology. Philadelphia: WB Saunders and Company; 1972. p. 275-343.